Here you can see some of my motorcycles, some i still have others are gone. The Yamaha was a nice drivabler bike, for not so much money. And the tank still had the original paint. After some tuning/service the Engine was ok. The front fender was not origonal, but it was a good bike. The bike was a writeoff. I spent two days at the hospital, i had some "extensions" on my spine broken off. And my left knee took some brusing, Later i had to have some surgary on it. Check out the number plate and you can se this what not the right bike for me. Three months later i found an ad in a local paper.. 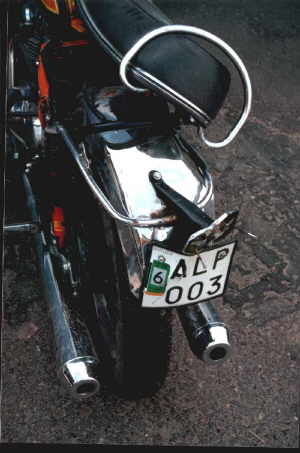 The bike was a fairly good runner, it had some exhaust leaks..
Four into one Exhaust pipe, was loud. Same as it was in the seventies. 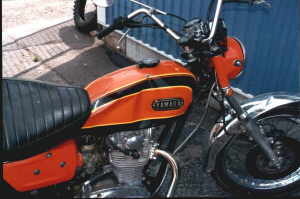 Thatank and the Covers is in nearly new condition, Original paint. 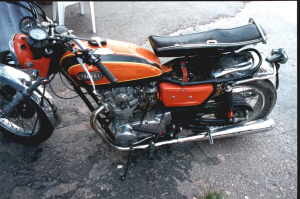 During the winter í had the engine out and put in a new cam chain in and some rings, and fixed the valves. During the end of 2002 season the Honda developed a knocking sound from, and the plan was to fix it during the winter, this did not happen. So when the sun came out in the spring i found this Yamaha XS2 1972 for a fair price. so this is what ive been riding on this summer. In the fourth owner of the bike, and it starts on the first kick. I have change the handle bars back to some more original looking, otherwis i only have been driving it. Of course a oil change was necessery. When the last owner tried to sell it, one of the customer dropped one of the side cover when test driving. And when the owner found it it was flat casued by a car drivin over it. I got it with me. After some banging with the hamme rit was presentable again. I had to buy a new mounting bolt for 10$, i primed it and mounte it. since i some plans for a new coat of paint.